Entrepreneurs with riskybut potentially valuable ideas often face difficulty raising money. It is hard for investors to assess whether the venture’s technology is as good as the entrepreneur claims it to be. It is also hard to monitor the entrepreneur to ensure that she isn’t wasting the investors' money. These and other ‘frictions’ in entrepreneurial finance have traditionally impeded arms-length retail investment in early stage, private ventures (Hall and Lerner 2010). Instead, venture capital firms (VCs) concentrated in a few areas such as Silicon Valley are the dominant investors. For entrepreneurs seeking capital, physical proximity to and personal connections with VCs have been crucial (Chen et al. 2010). Initial coin offerings (ICOs) may be a significant innovation in entrepreneurial finance. Blockchain-based digital assets offer cryptographic security and credible commitment devices, which may permit a broader range of individuals to invest in high-risk, high-reward new ventures and enable entrepreneurs who lack access to networks of conventional investors to raise financing. In an ICO, a blockchain-based venture raises capital by selling cryptographically secured digital assets, usually called ‘tokens’. These ventures often resemble the startups that typically finance themselves with angel or VC investment, though there are many scams, jokes, and tokens that have nothing to do with a new product or business. Explosive fundraising has attracted interest from entrepreneurs, investors, and regulators. 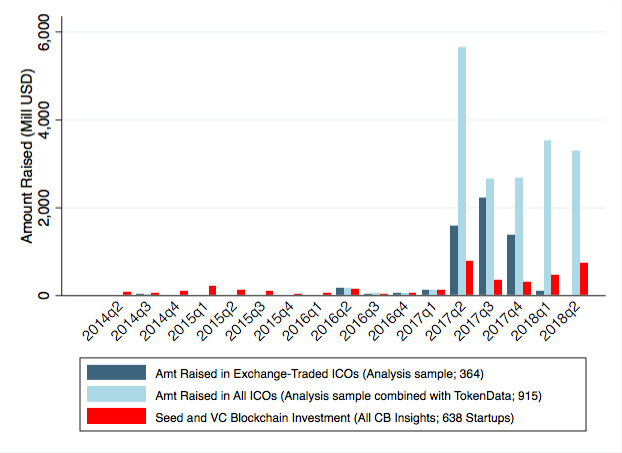 Between January 2014 and June 2018, ICOs raised over $18 billion (see Figure 1). At least 15 individual ICOs have raised more than $100 million. Note: This figure compares the amount raised through ICOs with the amount raised by blockchain-related startups. Data is quarterly from 2013 through the second quarter of 2018. The dark blue bars show total funding in our estimation sample of 453 exchange-traded ICOs (of which amount raised is non-missing for 364). The light blue bars combine our estimation sample with all remaining tokens that had completed ICOs and available amount raised from the TokenData database. ICO token buyers include prospective customers, but appear to primarily consist of speculators. Tokens are natural targets for speculation because they are usually exchangeable for fiat and cryptocurrency. This liquidity is an attractive feature compared to conventional VC securities (Metrick and Yasuda 2011). However, it may have a dark side if issuers' ability to cash out quickly undercuts their incentives to build successful businesses. Issuers launching ICOs face design tradeoffs that are not unlike those for an IPO of equity securities: target proceeds, fraction of total token supply sold, pricing mechanism, distribution method, lock-ups and set-asides, token rights, and choice of exchange. In a recent paper (Howell et al. 2018), we offer a detailed discussion of these tradeoffs as well as how ICOs work in practice and the regulatory landscape (most importantly whether ICO tokens have the legal status of securities and thus costly disclosure, liability, and compliance requirements). The first is a general-purpose medium of exchange and store-of-value cryptocurrency, such as bitcoin (these are often termed ‘coins’). The second is a security token, which represents a conventional security on a blockchain to reduce transaction costs and create a record of ownership. The third is a ‘utility’ token, which represents the right to access a service that the issuer will provide through a new network. Utility tokens comprise the largest and most well-regarded ICOs and are our primary focus. While they can be simple ‘corporate coupons’ that give the holder the right to an issuer’s product or service, the most well-known ICOs employ them as the means of payment in a new marketplace. Why would a platform need its own token? Proponents argue that blockchains with native tokens permit disintermediation of internet-based marketplaces, such as Uber or Facebook, where the platform developer currently controls the platform and extracts surplus. In the blockchain-token model, platform management is decentralised and value accrues to token holders. The value proposition for many utility token ICOs requires the token's value to increase with the value of the network, enabling a decentralised new platform to have several important features. First, the token can reward the network creators without giving them control after the network has launched. Second, token buyers may be willing to fund the platform's development, speculating on its long-term success. Third, like concert tickets, food stamps, or stock certificates, the token's value is tied to access to a specific good or service with limited use elsewhere, creating a degree of customer commitment. When its network launches, Filecoin will be a decentralisedcloud storage marketplace that connects people who wish to store digital files with others who have excess storage capacity. Its token will be the sole form of payment accepted on its platform. As in many other ICOs, a private ‘pre-sale’ preceded the main public sale to provide token discounts to insiders, previous equity investors in Protocol Labs, and other strategic investors. Pre-sale investors, including prestigious VC firms such as Sequoia Capital and Andreessen Horowitz, paid an average of $0.57 per token and agreed to long vesting periods. In the main public sale, investors paid an average of $2.57. Pre-sale discounts are akin to the lower prices that early investors receive for conventional startup equity, in exchange for taking on more risk, providing services, and signalling quality to the market (Hellmann and Puri 2002). We closely study a sample of 453 tokens that completed ICOs and were subsequently traded on a secondary market exchange for at least 90 days. This subset of relatively successful ICOs raised the equivalent of $5.7 billion, and their issuers hail from a broad range of countries (see Figure 2). 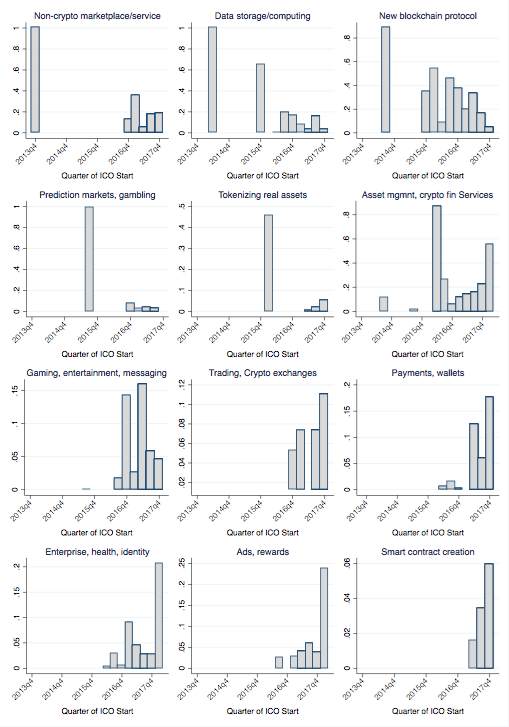 The sub-sectors in which ICOs occur have shifted over time as the industry matures (see Figure 3). We compare the sectors in which ICOs concentrate to those in which VC-backed blockchain- and digital asset-related startups concentrate to understand which sectors are well-suited to ICOs. Notably, about half of the VC-backed startups have an enterprise focus (business-to-business), while ICO ventures typically target atomized consumers or developers (business-to-consumer). Note: This figure shows the location of ICO issuers in our sample. 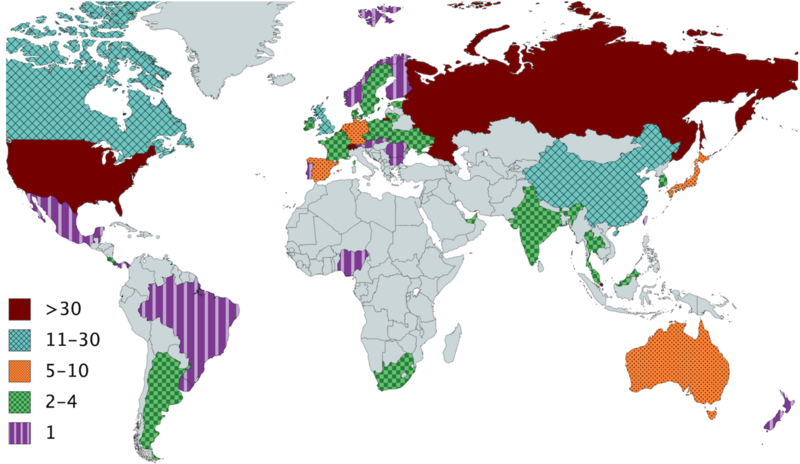 Not shown are the Cayman Islands (3 ICOs), Curacao (1), Cyprus (1), Gibraltar (1), Marshall Islands (1), Saint Kitts (1), and ICOs whose teams are dispersed across > 4 countries (28). There are additionally 87 ICOs whose issuer locations are unknown. Note: This figure shows how different sectors have played larger roles in the ICO market over time. Each graph plots, for one of the 12 sectors, the quarterly amount raised in that sector as a share of the total quarterly amount raised. The sample includes the 453 exchange-traded ICOs in our estimation sample. What types of issuer and token are successful? We study which issuer and token characteristics are associated with success. Our primary criteria for success are measures of liquidity, which we observe at horizons up to six months from the first trading date. Figure 4 shows that liquidity has generally increased over time, though there is large variation across tokens. Figure 5 shows large variation in abnormal returns (relative to Bitcoin, an industry benchmark) but no similar upward trend. We focus on liquidity for two reasons. First, from the perspective of an early stage investor, liquidity is a central benefit of ICOs relative to conventional financing instruments. Second, liquidity captures market depth and interest in the token, in the absence of commercial success measures (few issuers have launched their networks as of this writing). Also, in their theory of token-based platforms, Sockin and Xiong (2018) show that token trading enables information aggregation from potential customers about demand for a platform’s service, and conclude that an individual's decision to join a token-based platform depends positively on volume. 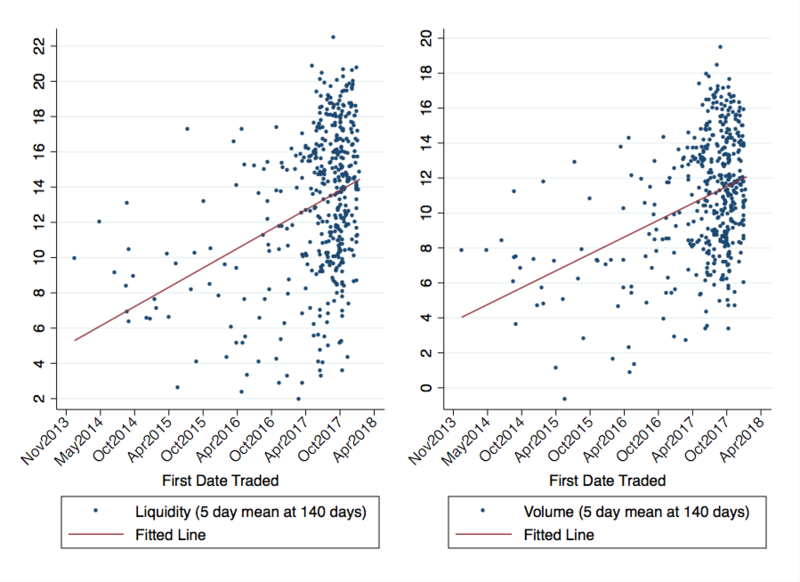 Note: This figure shows the liquidity measures 140 days (5 months) after the start of trading. Liquidity (left figure) is the negative of the log Amihud price impact (illiquidity) measure averaged over the past five days. Volume (right figure) is the log total 24-hour US dollar trading volume averaged over the past five days. 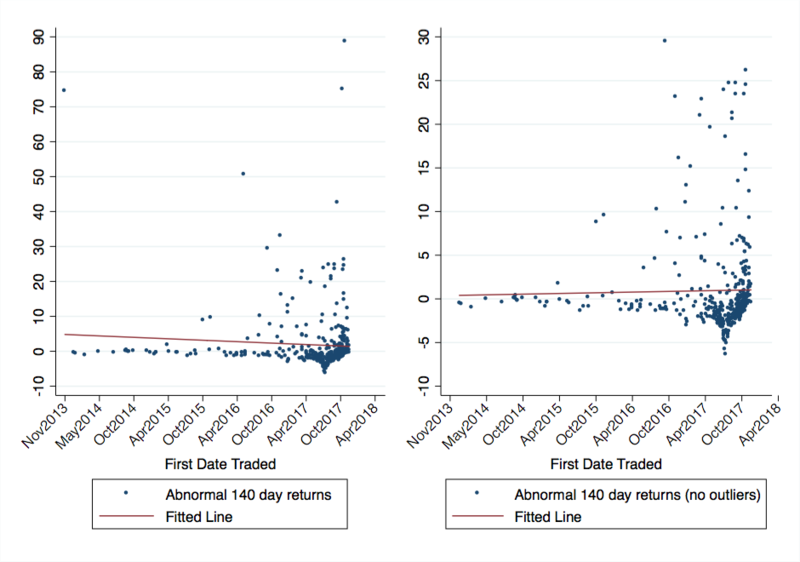 Note: This figure shows abnormal cumulative returns between the start of trading and 140 days (5 months) subsequently. Abnormal returns are raw returns less bitcoin returns over the same period. The right panel excludes observations with abnormal returns above 30. We find that liquidity and trading volume are higher for tokens that (i) offer voluntary disclosure; (ii) credibly commit to the project; and (iii) signal quality or potential to create substantial value. Disclosure measures associated with success include making source code public on Github, publishing a white paper, and publishing an intended budget for use of proceeds. Community engagement, measured by the number of Telegram group members (and to a lesser degree, Twitter followers) is also associated with success. A proxy for credible commitment to the project is an insider vesting schedule, which is hard-coded into the token contract. This is strongly associated with success. Signals of quality associated with success include prior VC equity investment in the issuer, holding a pre-sale before the public ICO, raising more money in the ICO, having clear utility value to the token, and planning to create a new blockchain protocol. New blockchain protocols usually intend to be the infrastructure for diverse applications, so while they may be riskier investments, their potential for value creation can dwarf that of applications built on other blockchains. We also find that an entrepreneurial professional background for the lead founder or CEO is strongly associated with success. Experience in the crypto community, finance, or computer science is not. In sum, these results suggest that in this nascent sector, information asymmetry leads to economic mechanisms that parallel other entrepreneurial financing settings. Chen, H, P Gompers, A Kovner, and J Lerner (2010), "Buy local? The geography of venture capital." Journal of Urban Economics 67(1): 90-102. Hall, B H and J Lerner (2010), "The financing of R&D and innovation", in Handbook of the Economics of Innovation, vol. 1, North-Holland: 609-639. Hellmann, T and M Puri (2002), “Venture capital and the professionalization of start-up firms: Empirical evidence,” The Journal of Finance 57(1): 169–197. Howell, S T, M Niessner and D Yermack (2018), “Initial coin offerings: Financing growth with cryptocurrency token sales”, NBER Working Paper 24774. Metrick, A and A Yasuda (2011), “Venture capital and other private equity: a survey,” European Financial Management 17(4): 619–654. Sockin, M and W Xiong (2018), “A Model of Cryptocurrencies”. We use the term ‘ICO’ for simplicity, but Filecoin does not use this term to describe its sale.